They say the way into someone’s heart is a through their stomach. In my case, I have a sandwich shaped keyhole in my tummy that will let you right in – I absolutely love sandwiches. Earlier this year, while Mike and I were in NYC, we planned a little walking/eating tour from our hotel in Soho all the way to Smorgasburg, in Brooklyn. Our first stop was at Parm, for a meatball parm. 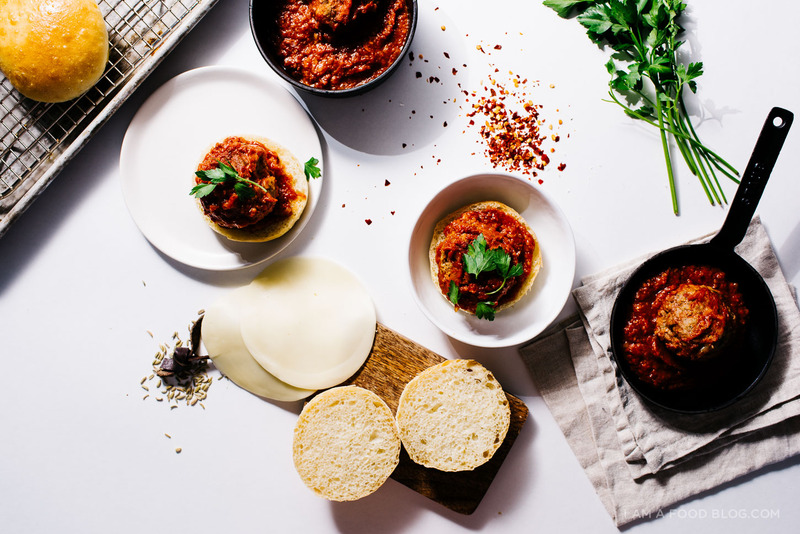 Think: a tender pork and veal meatball patty simmered in tomato gravy, topped with loads of cheese, tucked into a supremely soft sesame seed bun. Super delicious and super messy. Normally, this isn’t the kind of sandwich I would order to go, but we were on a schedule so I insisted, even though Mike thought it would nice to be civilized to sit down and eat at the counter. Luckily, they cut the sandwich in half for us, which made it infinitely more easy to eat. The plan was to walk and eat the sandwich at the same time, which, now, thinking about it, isn’t really a good plan at all. I have problems walking and eating, unless it’s something simple, like chips. Even ice cream proves difficult to me – I’ve lost many an ice cream cone to the sidewalk. Luckily, I didn’t drop my half of the sandwich or get any sauce on myself, mostly because after the first bite, I insisted we stop walking so we could stand in one spot and just enjoy. So there we were, standing on the corner, just eating our meatball parm, just a block away from Parm. Anyway, the sandwich made an impression on me because I just had to make meatball parms when I got home. These little guys aren’t as good as Parm, I’ll admit (they do have years and years of experience! ), but they’ll do in a pinch. 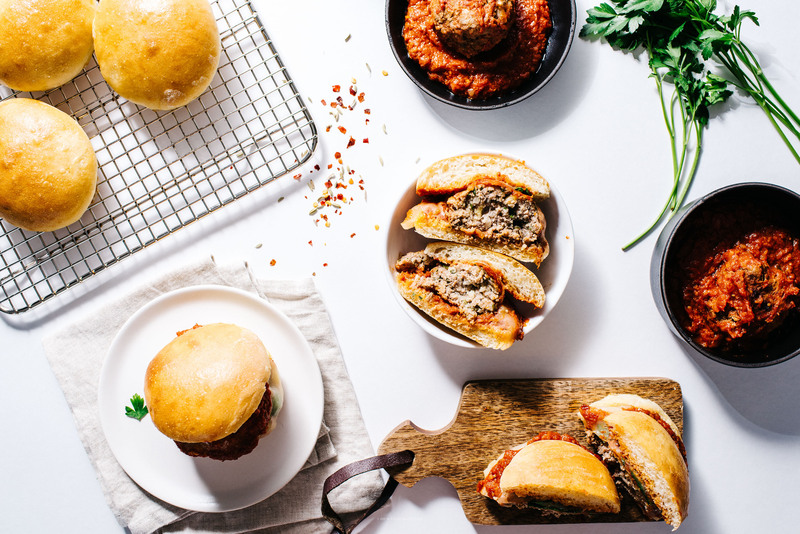 They definitely satisfy the craving for a saucy cheesy meatball sandwich! Make the sauce: heat up the oil in a large skillet over medium heat. Add the crushed red pepper, fennel seeds, onion, garlic and carrot. Cook, stirring, until slightly softened, about 5 minutes. Stir in the crushed tomatoes and salt. 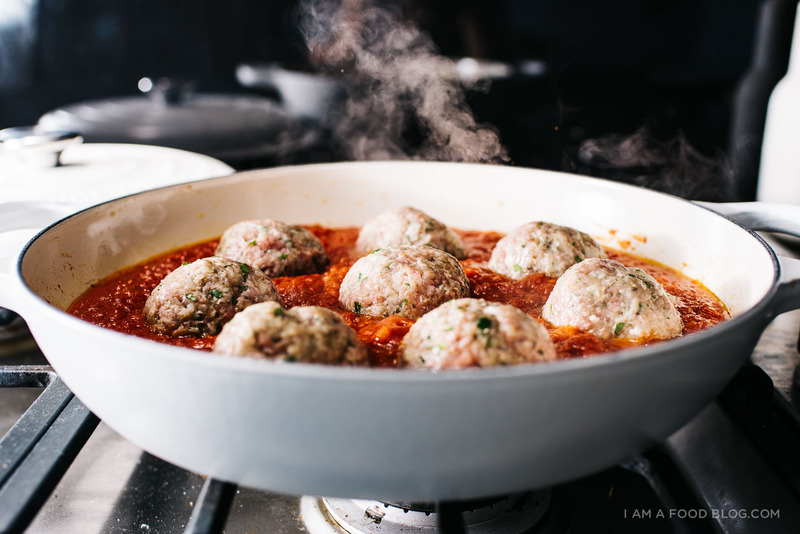 Keep on a low simmer while you make your meatballs. 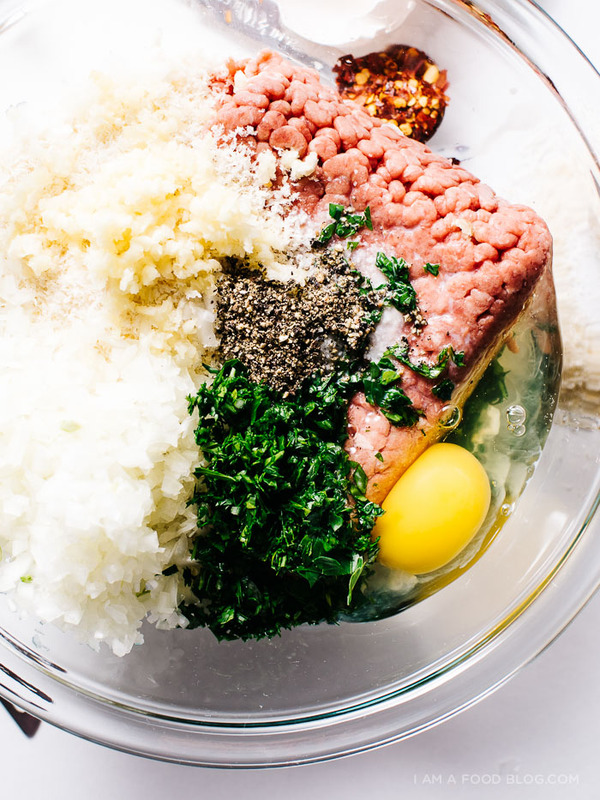 Make the meatballs: gently mix together all of the meatball ingredients together in a bowl. 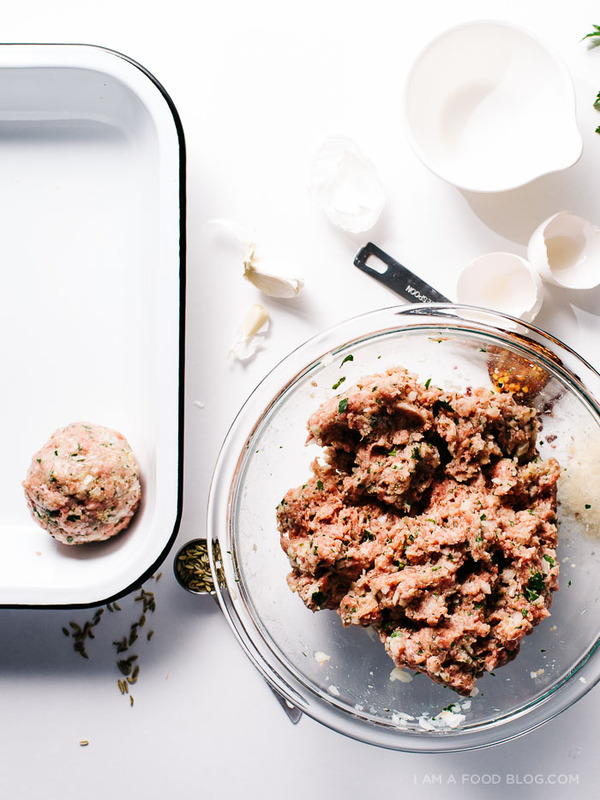 Shape into large meatballs or meatball patties and simmer in the sauce, partially covered, over medium heat, flipping occasionally. Simmer gently until cooked through, about 20-25 minutes. Make the sliders: preheat the oven to 400°F. Arrange the buns, cut side up, on a lined baking sheet. 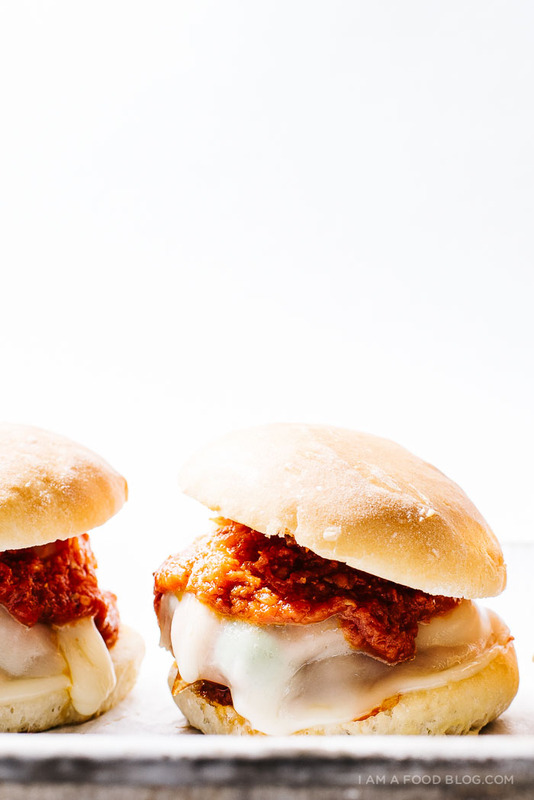 Top the bottom buns with a bit of sauce, a meatball, and cheese. Bake until cheese is bubbly and melted, about 3 minutes. Sandwich and enjoy hot! 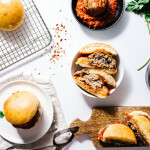 meatball parm subs are my favorite! these sound even better, because the big ones tend to get messy and sit ungracefully in my stomach. Tasty and travel friendly, with just a hint of dangerous! I’d better walk while eating these, otherwise I might eat 5, or even 50! 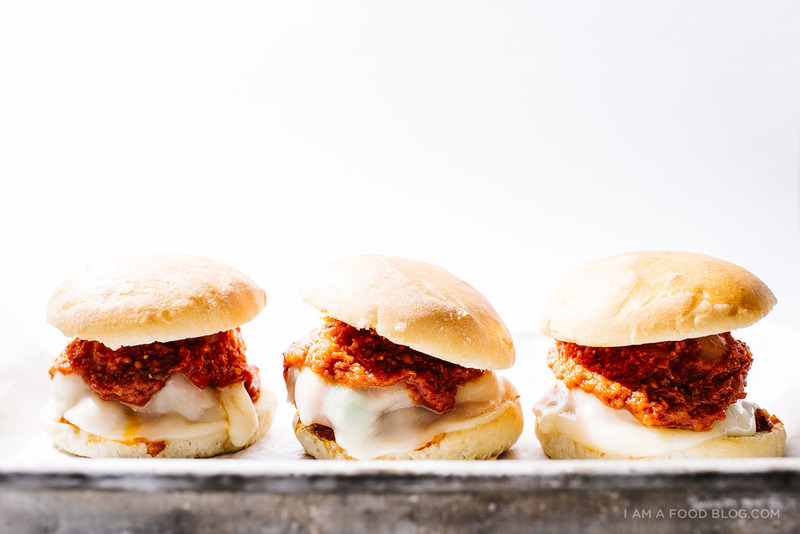 These are making me really regret the boring eggs I had for dinner… Cheesy meatball sliders?!?!? They look soon dang good! Why haven’t I had Parm? I’m adding it to my list for next trip. Also, as you know, anything burger-esq, is the key to my heart. WINNER. Oh my goodness you are pulling on every single one of my heart strings here. Divine!!! This looks so good and I bet it tasted even better. I’ve just started reading through your food blog and I am a fan.